Yesterday I uploaded the last podcasts from the 2012-13 session. I’ll admit as soon as the last file went up I left the office in search of a much needed caffeine boost! You might have noticed, but the last few days have been very busy with lots of podcasts appearing on the site all at once. I’ve uploaded files from various conferences including this year’s Anglo-American on the topic of Food in History; the Materialities of Urban Life in Early Modern Europe interdisciplinary conference which looked into debates regarding the public, private, commercial, domestic and civic material cultures. Then finally podcasts from the Mobilising London’s housing histories: the provision of homes since 1850 conference (click on the links to access these podcasts). Lots of conferences, lots of seminars, a great swath of new content! We now have 590 podcasts in total on History SPOT. That’s no small number and has been achieved over a four year period, most of which have been created over the last year. Of these the majority come from the IHR’s seminar programmes (now numbering 26 groups who have given podcasting a go!) and from 20 different conferences held by the IHR. History SPOT is also home to a smattering of lectures, workshops and interviews all recorded as audio or video. Below is a long list – or index – of all the podcasts that have been created this year. Hopefully there will be something for everybody. Personally one of my favourites was this year’s policy forum from the Anglo-American conference (see the third from top). Some of the audio is a bit wonky as there was only one microphone but five speakers, yet the topic of discussion was highly interesting. The title is perhaps misleading. This ‘forum’ was all about the food industry in the present and how it will cope in the future with a rising population, threats of global warming, and (seemingly) no one prepared to deal head-on with the major issues facing us in terms of food production. It was all a bit scary really. As a result I might start looking into getting an allotment for when the world ends. And finally, the podcasts from the Going Underground: Travel Beneath the Metropolis 1863-2013 conference which celebrated the 150th anniversary of the London Underground. This year I would also like to welcome the following seminars to History SPOT: Christian Missions in Global History; Disability History seminar; Gender and History in the Americas; Imperial and World History; London Group of Historical Geographers; Marxism in Culture; Modern French History; Modern German History; Oral History; Public History; and the Socialist History seminar. Lots of groups have given podcasting a go this year. As per usual we have also had podcasts from our staples including the Voluntary Action History seminar; Metropolitan History seminar; Digital History; British History in the Long Eighteenth Century; Latin American; and Archives & Society. What can we learn from housing history? 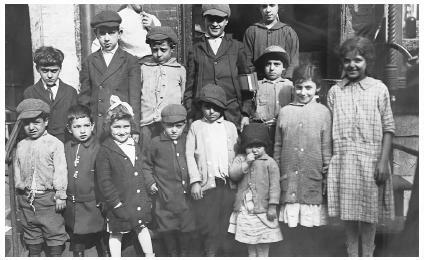 Web Archives: A New Class of Primary Source for Historians? Material Culture Panel: The Significance of Things. Keynote speech on Why Material Culture? Secularisation: Or Otherwise in Eighteenth-Century England? Panel members: Penelope J. Corfield (Royal Holloway, University of London); Jeremy Gregory (University of Manchester); John Seed (Roehampton University). “The Drab Suburban Streets Were Metamorphosed into a Veritable Fairyland”: Spectacle, Ritual and Festivity in the Ilford Hospital Carnival, 1905-1914? Occasionally History SPOT plays host to podcasts created beyond the IHR. The Global History seminar and Franco-British seminar are excellent examples of this. Most recently, we have played host to the proceedings of a 2011 conference by the Historians of Education in Scotland. The conference, held at the Royal Society of Edinburgh on 21 October 2011 investigated various elements of education in Scotland over the last 200 years. More information can be found on the Historians of Education in Scotland website that is currently in development. Inclusion of podcasts from events beyond the IHR is something that we are keen to encourage. Not only does it expand our range of resources, but it also enables historians to find podcasts that would otherwise be difficult to discover when on their own. Only historians directly interested in Scottish educational history are likely to find the podcasts on the HEd website, yet the content of these podcasts might well be interesting to historians whose primary interest intersect that discussed in one or all of the papers. The wider availability and findability of podcasts is something that the IHR is taking very seriously and future updates to History SPOT will reflect this. In the meantime if anyone has audio or video recordings from History conferences, seminars or other events that they think might fit within History SPOT then please do get in touch with us at history.spot@sas.ac.uk. I have been writing this blog ever since I took on History SPOT for the IHR over two years ago. It took me a while to find my feet as I had never created or written a blog before. My remit was to make the blog more interesting than just relaying update reports which would quickly become dull not only to read but also to write. “What we want is a ‘day in the life’ of a project officer” Jane Winters (head of IHR Publications) told me on my first day. Looking back at my blog posts I don’t think I have ever actually done that. I have discussed research training and the nature of podcasts. I have narrated the highs and lows of live streaming. I have summarised or reviewed numerous IHR podcasts and given the odd project update. But I have never talked about my working day. Perhaps, it is time to do just that. Time to indulge in a little bit of ‘this is what I do’, although I won’t go on for too long I promise. My working day begins at a railway station – queued up with other commuters in untidy columns approximated to where the train doors will open. My train journey takes about 30 minutes, in which time I often listen to one of our podcasts and take notes. This morning I was listening to a talk about the development of cricket as a sport in France. Yesterday, the subject was ‘Memory’ as a focus for looking at the early modern period. I never know what subject will come up next, which makes the process all the more fun. After dodging crowds of commuters its coffee time! In the café I will generally write up my blog posts, usually from the recording I was listening to on the train. Then it’s a short walk into the office where I pick up the audio recorders from seminars held the night before. Once at work proper, I check my emails and upload the day’s podcast to History SPOT and add a new blog post to the History SPOT blog. These are daily tasks Monday to Thursday which I tend to do early on so that I can start to work though my tasks list for the rest of the day. I then upload the audio file from the recorder to my computer and edit the file. This usually consists of chopping off the beginning and end, adjusting the sound levels (as much as possible), and adding metadata to the finished mp3. For the rest of this morning I worked on the HISTORE project. At the moment I’m working on a short case study about the John Foxe Online project as an example of semantic data. Although John Foxe, and his Acts and Monuments was the focus of my PhD thesis, and despite helping out on some of the text transcription, I had thought next to nothing about what any of this meant in terms of the digital tools employed so this work is proving quite illuminating. In the afternoon I finished editing one of the Digital History videos – adding images to the video and zooming in and out where appropriate. This is time consuming work but quite relaxing and enjoyable. There is something satisfying about creating a short video. My next to final task of the day was to continue working on the Online Databases course that we are developing for launch in 2012/13. Mark Merry (its author) provided me with additional text and images this morning so now it’s a matter of uploading this to History SPOT and making it into something that will display nicely. This often involves working with some straightforward html coding and working out in what format the data should be displayed. Again, time consuming work, but quite enjoyable to do once I get into it. The final task of the day is to set up the audio recorders for tonight’s seminars. This varies. Some nights there won’t be any to record. Today is one such day. As far as the seminars are concerned we are still in the Easter period so groups have temporarily grinded to a halt. Other nights there can be anywhere between one to three events scattered throughout Senate House and Stewart House. This can mean some running around and up and down stairs. So, in a nut shell, that is roughly a day in the life of the History SPOT Project officer. From tomorrow I’ll get back to posting some more summaries of our podcasts. How do you find useful podcasts on History SPOT? There are three options. If you are interested in a particular seminar group or conference then using the index is the most straightforward method. Simply click on the podcast tab and your there! However, if you are looking for content on your specific research topic (for instance let’s say health) then you will want to look between events. One method for doing this is to type ‘health’ into the search engine. This will bring up results including event groupings, individual podcast pages, and any additional files such as pdf’s that include that search term. This can be a useful method to see what is there in all its forms. However, an alternative route would be to use the podcast tags. You can access these from the left hand column. 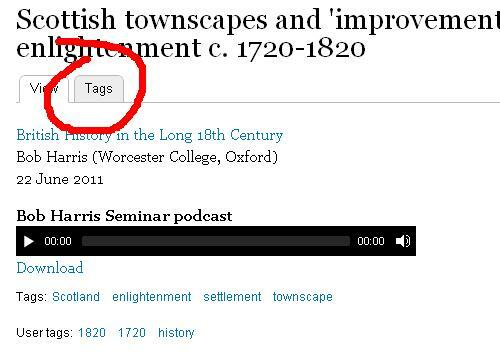 There are two choices: Podcast Tags (created by the History SPOT administrator) and User Tags (created by you, the users). The Podcast Tags have been selected from content in the podcasts but (admittedly) are not comprehensive or fully standardised. This is something we hope to improve upon in the future. By clicking on any one of these tags you will bring up a list of all podcasts tagged with that word. So for health (as of writing) there will appear 10 podcasts ranging from those made from last year’s Anglo-American conference on Health in History to seminar podcasts by the Global History seminar, Sports and Leisure History seminar, and Voluntary Action History seminar. If you feel that a podcast requires additional tags you can create your own (user tags). When you are logged in to History SPOT go to the relevant podcast and click on the ‘Tags’ button near the top of the page. *It should be noted that user tags will be monitored to reduce inaccurate tagging where possible. Tomorrow around 4.30pm you’ll find me running around setting up audio equipment in preparation for the first part of the IHR’s Novel Approaches: from academic history to historical fiction conference. The conference seeks to look at the intersection and relationship between the professions of academic history and historical fiction. It should be a lot of fun! I’ll also be there for the entire event taking notes. Not because I think I could be a budding novelist in the waiting nor just because I find the topic fascinating. No, this time I’ll be there because we are planning on doing something rather different with our podcasts. This coming Monday (21 November) we’ll open up our first ever virtual conference as a continuation of the two-day Novel Approaches event. What is a virtual conference you might ask? Well in this case at least it is an online site that continues our face-to-face conference well after it is finished. At scheduled times each day we will publish podcasts from the conference, articles, book reviews, and opinion pieces. We’re also planning on running a competition with some nice prizes on offer and will provide our ‘ultimate’ bibliography and list of relevant online resources. All of this is free although I would encourage you to register so that you can enter the competition amongst other things. What do we hope to achieve through this virtual conference? Well, for starters it’s not intended as a replacement for the actual conference. How could it be? However, we do want to continue and open up a discussion around the conference papers alongside various other resources. We very much hope those going to the conference will take part and that those unable to join us in person will find our virtual conference almost as much fun and of just as much interest. The podcasts will of course still appear on History SPOT in due course (in fact we hope to also be able to provide some video content although that is very much an experiment and might not happen). So please do join us on Monday as we start with a conversation between novelist and historian (Hilary Mantel and David Loades) followed by a plenary talk by Alison Weir (plus of course much more!). Before then please also visit our IHR Digital blog where I have been (and will continue to do so throughout the next week and a bit) posting on the topic of A History of historical fiction. I can’t (and won’t) say I’m an expert in this topic but I had fun researching the literature and learnt a lot along the way. Hope you enjoy the results! Hello and welcome to this week’s SPOT Newsletter. Today we’ll be looking at two seminars from our collaboration with seminar groups outside of the IHR taken from the previous academic year. We have been very fortunate to build ties with the Franco-British History seminar group at the University of Paris IV (Sorbonne) and with the Global History seminar group based at the London site of Notre Dame University. Each have their specific interests; one obviously focused on international or ‘global’ history whilst the other more narrowly focused (in geographical terms) to Britain (although in today’s example the Franco-British seminar group move their focus to Italy). The Franco-British group hear papers both in French and English so I’m only able to reliably review about half of their output but what I have listened to has been diverse and interesting. The first paper presented about this time last year was by James Thompson. Thompson gave a detailed glimpse of political life in late nineteenth and early twentieth century London through evidence in newspapers and posters. The ‘rebranding’ exercise by the Conservatives for the 1907 London County Council election perhaps echoes the need for governments in a media age to consider themselves as a type of consumable ‘brand’. In February this year Amanda Behm looked at the rise of Imperial history as a sub-discipline. I could easily see this podcast being useful for teaching historiography and as a starting point for those entering the world of Imperial history. A paper from the Franco-British history seminar that I particularly enjoyed was presented by Stephen Mosley. The Industrial Revolution is often hailed as the height of British power, but it came at a price – the pollution of Britain’s capital. This study of industrial pollution is described by Mosley as a ‘disaster in slow-motion’. The first podcasts from the Global History seminar group were created before I began the SPOT Newsletter so there are still some which I have not yet listened to. The first of these was presented by Patrick O’Brien with the title Myths of Eurocentrism and Material Progress. If anyone would like to write their own reviews please feel free to in the comment section below the podcast page. I’d be interested to hear what people think. The first paper that I reviewed from the Global History seminar came with the wonderful title: What might a global history of the 20th century look like? Angus Lockyer sees the history of the twentieth century as needing a stronger narrative and structure as far as the writings of historians are concerned. He sees the century as a period of tensions between multiple actors, separate logics and differentiated systems which can be dated back to the second half of the previous century. Will anyone take up Lockyer’s gauntlet to write such a history? I guess only time will tell. A paper of particular interest for me was Peter Barber’s discussion of the Image of the Globe in the Renaissance. Maps are always interesting pieces especially from a time when the Earth was still a largely alien and unknown place. So Barber’s discussion of globes in the 15th and 16th centuries provides a welcome study not only in past societies attempts to map their world but also in the culture that surrounded those attempts. Click here for our complete list of podcasts from the Global History seminar group . In a presentation to the Franco-British History seminar held back in March this year, James Shaw compared the role of equity in medieval and early modern financial transactions. In Tuscany, Italy Princely Equity emerged as an element of absolutist government. The Prince was given the power to correct the law through equity and kingly justice. Over time therefore equity in Italy shifted from the realm of legal scholars to that of the king (especially from the fourteenth century). Equity in Italy was not so much about the form of law but the intention behind market exchanges. Contracts could, for instance, be invalidated if the intention on either side was seen to be false or made without free will. Shaw therefore demonstrates that equity fitted between law and conscious, between legal order and moral order. In England around the same time a different form of equity emerged – one based around what historians call the Economy of Obligation. In England, Courts of Equity (i.e. the Chancery and Courts of Requests) worked in parallel to common and civil law. Equity courts were able to bring in a much broader range of evidence to consider but over time its flexibility was lost as the Equity Courts became more structured and controlled. For more on this subject see also: James E. Shaw, “Writing to the Prince: Supplications, Equity, and Absolutism in Sixteenth-Century Tuscany” Past & Present, forthcoming May 2012. Also back in March, William Clarence-Smith presented to the Global History seminar a paper about migrants from ‘Greater’ Syria to the USA, South America and other parts of the world. The paper is as much about why groups of people migrated to other countries as it is about what is meant for them to be Syrian. In the nineteenth and early twentieth century Syria was a region that had many interpretations and meanings for its populace and indeed for migrants who left the area. The Diaspora may have been caused for many reasons, but Clarence-Smith places some doubt on the established theory that it was entirely down to politics and civil unrest and suggests various pull factors as not only important but vital. I have been waiting to write that title for well over a year now. After a delay of over 5 months History SPOT is finally ready to launch! History SPOT is brimming full of podcasts from IHR seminars, conferences and lectures from 2009 to the present. In addition to our extensive archives you will have access to all new podcasts from the IHR in the coming months and have the opportunity to discuss, comment upon and debate their content online. In addition to the podcasts themselves History SPOT contains an archive of SPOT Newsletter reviews and abstracts which have thus far appeared on this blog along with various other additional resources. The SPOT Newsletter will be growing over the coming months adding opinions, additional facts and information, and mini bibliographies. History SPOT presents to you for free and for the first time material from our research training courses and from our expertises as a research institute. Initially we have provided two research handbooks: one on the subject of Databases for Historians and another on podcasting. More will follow soon. History SPOT is not just a place to search for content it is also designed so that you can interact with the subject matter. When you listen to one of our podcasts let us and other users know what you think. Is there something that you disagree with or do you have something to add to what our speakers discuss? History SPOT will be in Beta Mode for approximately one month while we iron out the final glitches and errors, however we would very much appreciate your feedback. Do you like the new site? Is there anything that you don’t like? What could we do better? Is there anything missing? Please do let us know at History.spot@sas.ac.uk or through the Contact UsLINK option on History SPOT. At some point soon I will write up another blog post here about the road to launch but in the meantime please do register for History SPOT, have a look around, and let us know what you think.